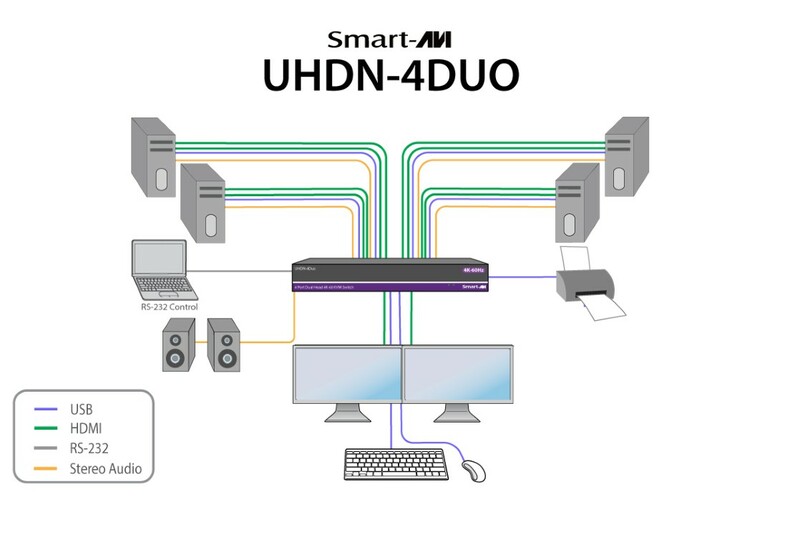 The SmartAVI UHDN-4P-Duo is a 4-port, dual-head HDMI 2.0 KVM switch with Ultra-HD 4K/60Hz resolution video emulation. It can control keyboard-mouse functions on up to four remote computers, and emulates video from HDMI source devices. Question: Does this support Bluetooth keyboards via a USB Bluetooth Adaptor? Using Bluetooth keyboards and mice with a KVM is hit or miss. This is related to the very different way in which Bluetooth peripherals communicate and a KVM's internal mouse/keyboard emulation. Since KVM vendors do not explicitly state support for wireless peripherals, we are unable to guarantee a particular Bluetooth setup will work with a particular KVM - For the best performance, we always recommend using a basic, cabled keyboard and mouse. That being said, we have customers who have had success in using Bluetooth devices by plugging the device into one of the USB Hub ports rather than the USB Keyboard port. In this case, you will likely need to use the push-buttons on the UHDN-4P-DUO rather than hot-key combinations for switching. This configuration may also lead to some loss in some functionality such as the keyboard emulation. Question: Is this switch operating system agnostic? I have to switch between different versions of Linux and Microsoft Windows operating systems. 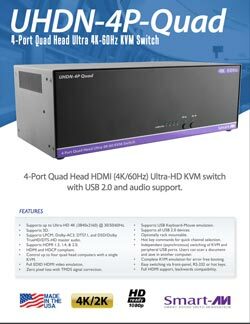 The UHDN-4P-DUOS is a plug-and-play device that does not require any separate drivers - this switch is operating system agnostic and should work on any version of Windows or Linux. Question: Does this KVM switch also allow for split mode where you can display PC1 on Screen 1 and and PC2 on Screen 2? 1) Use a Command Center (Keyboard and mouse) switch i.e. Adder CCS-PRO4. CCS-PRO4 supports multi-monitor setups, and would let you display PC1 on screen 1 and PC2 on screen 2 while i.e. dragging a mouse to switch between them. 2) Multi-User KVM-Over-IP switch i.e. AVX4016IP or a multiple KVM-Over-IP gateways would allow you to open up any of the connected source PCs in individual browser windows which you could move around (i.e. have window 1 with PC1 on screen 1 and window 2 with PC2 on screen 2). If this is not quite the solution / application you were looking for, or you would like to further discuss your application, please feel free to contact your KVM Switches Online sales representative directly. Question: Does the UHDN-4P-Duo support 4K 60Hz RGB(YCbCr 4:4:4) 10-bit? While it does support 4k60 RGB, it only supports the 8 bit variant. For a KVM that supports 4K 60Hz RGB(YCbCr 4:4:4) 10-bit, you may want to consider the Aten CS1944DP Dual-Monitor DisplayPort KVM as an alternative.